In this episode, everybody's trapped in their own happy world where their families are either reunited or removed and where they can watch themselves get crucified in peace. Does anyone else get the feeling the writers had way too many ideas about how they wanted this final battle to go down? It goes from one concept to the next, momentum shifting on a dime as they fight illusions, get stronger or change venues entirely. This episode alone feature three different segments of the battle, all with different moods and themes, and the fight isn't even over yet. When the series of illusions hits, we all harp on Yolei's, but TK and Kari aren't much better. The intention is to show each character's happy world if their primary source of angst is removed. This whole business with Oikawa has Cody thinking about his Dad and his love of the Digital World. So that one's fair. Ken still bears the scars of his Digimon Emperor days and is desperate to repent. Also fair. Everybody agrees that Yolei's fight for attention with her brother and sisters and her desire to make her siblings disappear is completely out of nowhere and totally crazy. And it is. It was bad and she should feel bad. TK, meanwhile, considers his family's breakup his primary angst. This too has never come up with him. In season one, Matt had all sorts of issues with it and TK was happy in the brief moment that Hiroaki and Nancy were together, but in season two everybody seems pretty accustomed to the arrangement, TK saw Matt and Hiroaki often enough and nobody's crying about it. TK's primary angst had been his fear of losing Patamon again and his anger towards abusing the powers of darkness. To fantasize about this instead is quite superficial. Kari, whose duties as digidestined are more intense than anyone's, to the point where she gets possessed or goes crazy on multiple occasions, just wants to share this experience with all the boys and girls. Seriously? 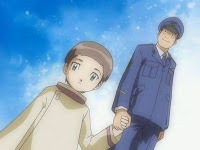 The concept of digidestined without any responsibility hasn't been invented yet, and for Kari to dream it up after all she's been through is the most superficial fantasy of the lot... after Yolei's, of course. Davis ends up pulling everybody out of their problems, unaffected by the illusions because he didn't have anything to fantasize about. Somehow this makes him the weird one. Are we trying to suggest that there is no such thing as being content? Sure, he's got an unrequited crush, an annoying sister and some undiagnosed mental illness. Why is it so wrong that he shows a little perspective and realizes that none of that matters stacked up against the giant monster trying to destroy the world? He has a normal two-parent family, plenty of friends and hobbies he cares about. What's the problem with being content with that, especially compared to the crap Yolei, TK and Kari are dreaming about? It's rare for the primary character of an anime to be comfortable with his life and it may be flawed storytelling, but that is not the fault of the character himself. Part two of the tour capitalizes on the essence of the world granting desires and allowing everybody's Armor, Champion and DNA forms to pop out and start pummeling MaloMyotismon, logic be damned. This part's just fun, and even appropriate to the series. 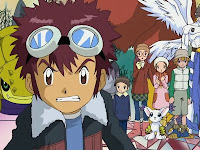 This season is unique in the way Digimon have multiple armor forms and Rookies have as many as three options to evolve into. Throwing them all into the mix together is a good way to acknowledge this quirk and give all the forms a proper sendoff. It would have been even better had this been the way MaloMyotismon was ultimately defeated. Instead, he's knocked in the Digital World somehow, where he starts eating up all the darkness, regaining his strength and stretching this into yet another episode. Think about that- it could have ended here and it all would have been just fine. Cody overcomes his fantasy by promising to share the Digital World with his mother. While parents have known about the Digital World and have been supporting their kids, this is the first time anyone's actually talked about showing it to their mother or father. It's rarely suggested again. Gatomon suggests that Myotismon is lazy, even though all we've ever seen of him suggests that he's merely calculated and efficient. There's a difference between making work easier and being a bum. Regardless of the legitimacy of their fantasy, everybody but Ken seemed to break out of it in a hurry with just a little urging from their partner. Makes them look more like passing foolish notions than deep-seated angst. Ken gets a disturbing image of his Digimon Emperor persona crucified and attacked by revenge-minded Digimon. Now this is deep-seated angst! It takes everybody to jump in and pull him out of this happy place. 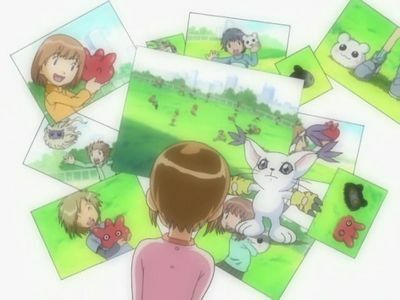 Can you imagine what this scene would have looked like if Chiaki Konaka wrote this season instead of Tamers? Gates must be opened to go from the Digital World to the real world and back, and a gate had to be opened to reach this weird fantasy world. So how do they get from the fantasy world to the Digital World by breaking a MaloMyotismon-sized hole in the wall? No matter the speculation about the origin of this fantasy world, it shouldn't work that way. "Can you imagine what this scene would have looked like if Chiaki Konaka wrote this season instead of Tamers?" I've tried to imagine what 02 would have been like had Konaka written the entire series and dear -lord- there is no doubt in my mind that Ken's mental torture would be twenty times worse than Juri's. That aside Dagomon could have remained in the storyline as a major threat, which would have been excellent (as you mentioned in an earlier post, I think). Some food for thought: imagine if the D-Reaper used Ken as its source of angst, especially right after the Kaiser arc. Fun times! Gods, no. Jeri was a barely troubled kid and look how messed up she was upon leaving the D-Reaper. Ken suffered so much, if he was in Jeri's place... *shudders* He wouldn't even be human anymore when he gets out. Though I'd quite enjoy seeing Davis as desperate as Takato to get Ken out of there. See, I always thought it wasn't about what they wanted if their angst was removed, but what they desired to be happy, which I believe is different. Yolei thought she'd be happier if she was an only child. Even though T.K. might have been okay with the arrangement, he would be happy to have his family back together. Kari would be happy if everyone could share a relationship with Digimon like the one she shared with Gatomon without the death and fighting. Cody would be happy to have his father back. Ken would be happy to finally atone for all his sins. While Davis, like you said, was content. The way you saw it would take these illusions in a different direction, which is why I don't quite think that was what the writers were going for. I think you're right, but that still doesn't make Yolei's pudding spree any less random. For all the complaints people have about the finale, the only thing I really dislike about all this is Magnamon's lack of an appearance during this segment. I mean seriously, he has the power of Miracles. They're in a realm where the impossible can be made reality. Nefertimon and Angewomon have a pretty cool combo attack in this episode: archaeological shards of light! They really do drag the battle out a little too long. MaloMyotismon constantly gets slammed over and over again and yet stands right back up. They did everything short of dropping a nuke on him. And why did they choose Shakkuamon over MagnaAngemon? With the help of Paildramon and Silphymon, Shakkuamon held back BlackWarGreymon. MagnaAngemon almost beat BlackWarGreymon single-handedly. Which do you think would have been a better choice against MaloMyotismon. TK wants more of Hiroaki Ishida in his life, is not an angst we can all understand?